Near the end of July my 65 acres of oats (underseeded with red clover) were looking good, at least I thought they were. There was a fair amount of foxtail mixed into portions of my fields. I thought I could deal with them by running them through the combine (wrongly, as it turns out). We had some heavy storms and approximately 90% of the oats "lodged", or fell on the ground. This makes it very difficult to pick up with the combine, especially since I had 12" or so of red clover beneath the oats. 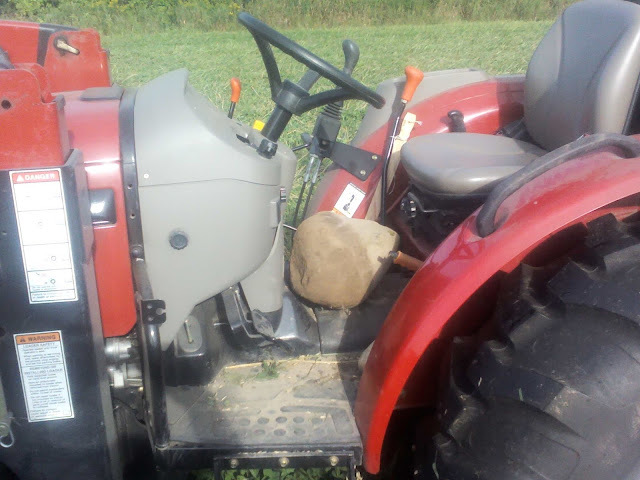 I also knew that I had rocks left in the field, this past spring I didn't get them all, and they ruin machinery. This meant we wouldn't be harvesting any oats. Which itself was problematic as the local elevator stopped accepting oats a month ago (an unprecedented act according to locals). Oats no longer have feed value - modern animal rations based on corn/soybeans promote faster weigh gain, hence profitability. There is no room for a second place finisher. Put that bit of knowledge up against the insistence by the soil preservation and university researchers who say that you should add a small grain (e.g. oats) to your crop rotation. Well, what to do with the oats? Prior to the decision to stop taking oats, grain buyers were paying just about the out of pocket cost of production for them. If, and it's a big if, you can get the "test weight", or density, high enough, the oats can qualify as "food grade" and there's a slight premium paid for that. But you need to store them after you harvest them, you can't just truck them directly to the buyer. I don't have storage bins. 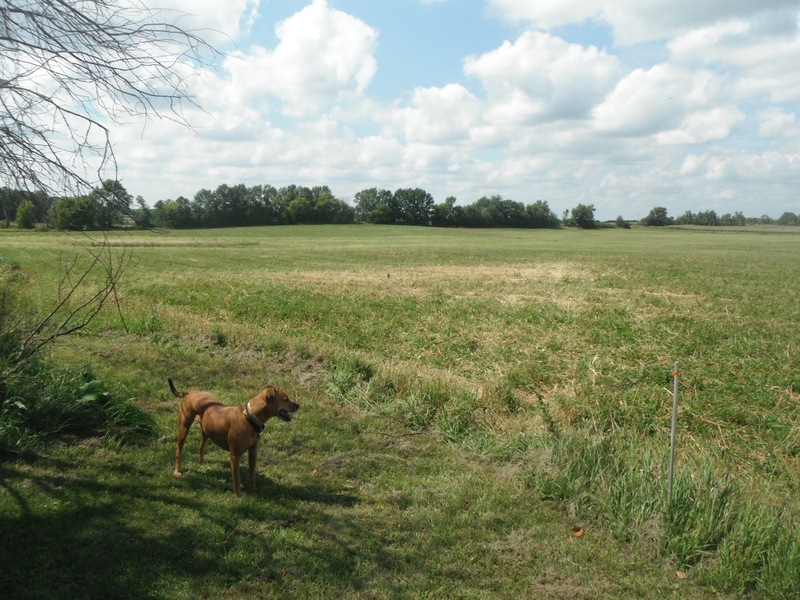 The farmstead near my 65 acres has 2 old ones, which I contacted the owner about renting. He was open to it if I needed them (if my oats were dense enough). That said, I'd have to pay to store them and hope that no mold appeared. I'd augur them out of the combine/grain truck and into the bins. Then when I sold them in 6 months, I'd augur them into a truck. A lot of this had to go right to get a couple thousand dollars. But everything didn't go right. The reason I grew oats was to provide a "nurse crop" for the clover, and then after harvesting the grain, the roots/stems decay into the soil to build up it's organic matter. Both oats and clover would crowd out weeds, and if they couldn't, we'd "harvest" the weeds along with the oats. 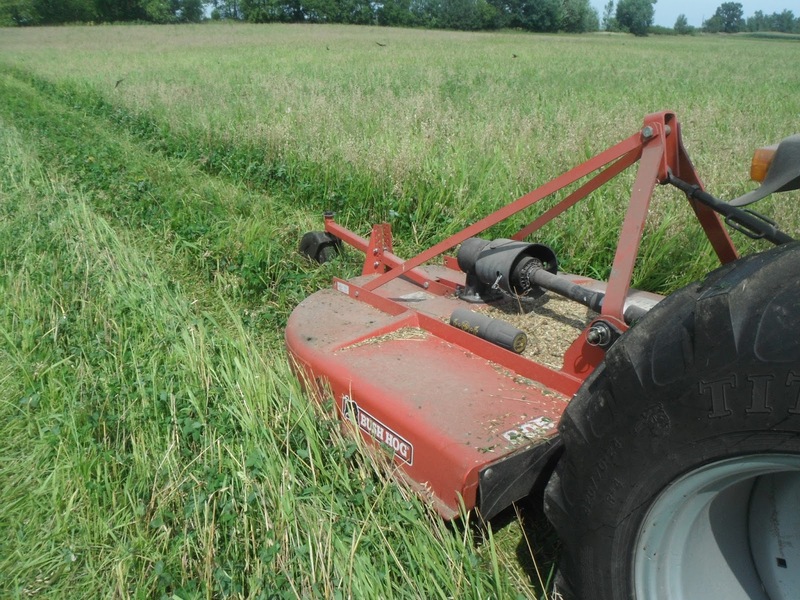 The clover would remain after the oats were harvested and continue to fix nitrogen for the following 2 years. Then I can plow it under and plant corn, hopefully without having to add too much (expensive) fertilizer -- I spent $4000 on composted chicken manure this year. That year of corn (2018) will be my first organic harvest. That is why I need to get rid of weeds and build fertility. And get rid of rocks that bust up metal blades. 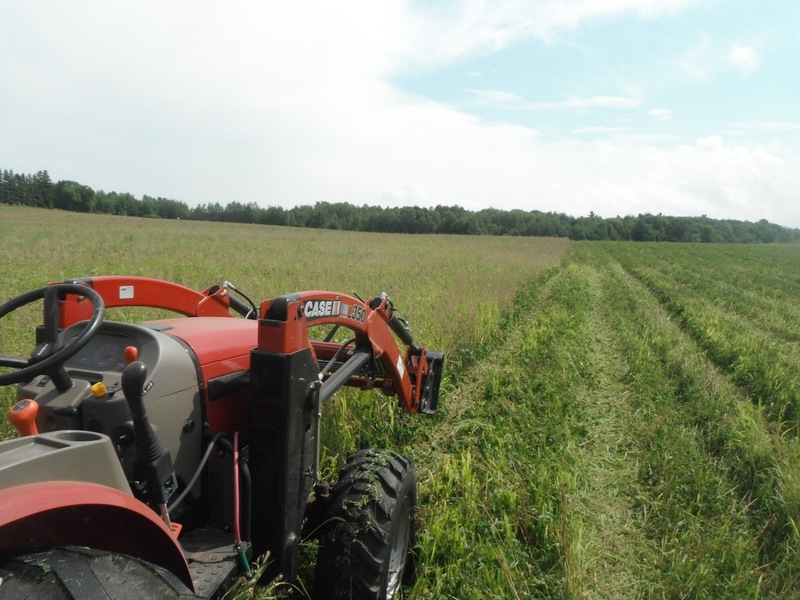 With no oats to combine - and too many weeds even if the oats hadn't lodged (green material clogs the augurs in the combine, you need dry seeds so everything flows) - I decided to mow the 65 acres with a five foot wide Bush hog. There was too much foxtail to make hay and too many rocks that would destroy the hay making equipment. The short green leaves are red clover. The brown are oat stems/hulls. The taller green plants are foxtail. Foxtail has very tough stems, forcing me to drive slowly through them in order to cut them all off. For a long time I couldn't figure out why I had these wispy strands after I mowed. The blades were dull! I had to buy a cordless grinder - no power in the field - to sharpen them up. There's a church and cemetery in the corner of my land. This is one of the larger rocks. I could feel the tires bump over them and I'd stop and get out. Many rows I'd have the floor of the tractor full of rocks. At the end of the row I'd throw them in the fence line next to a tree. 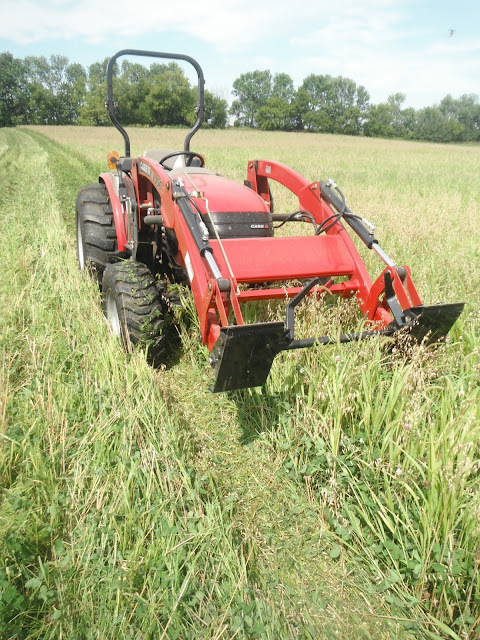 It took me seven days to mow the 65 acres. I think I mowed down all the foxtail before the seed heads were viable, we'll see. If not, I might have to do it again to knock it back. Foxtail also does well in compacted, poorly drained soil. The previous farmer ran his equipment through the low areas when they were wet, probably so he could get the crops off, and left large ruts. This is one possible cause of the compaction. Also, I might add a drain tile to one of the wetter areas to remove excess water. I'll probably leave the clover intact all next year, mowing the weeds if they come up. 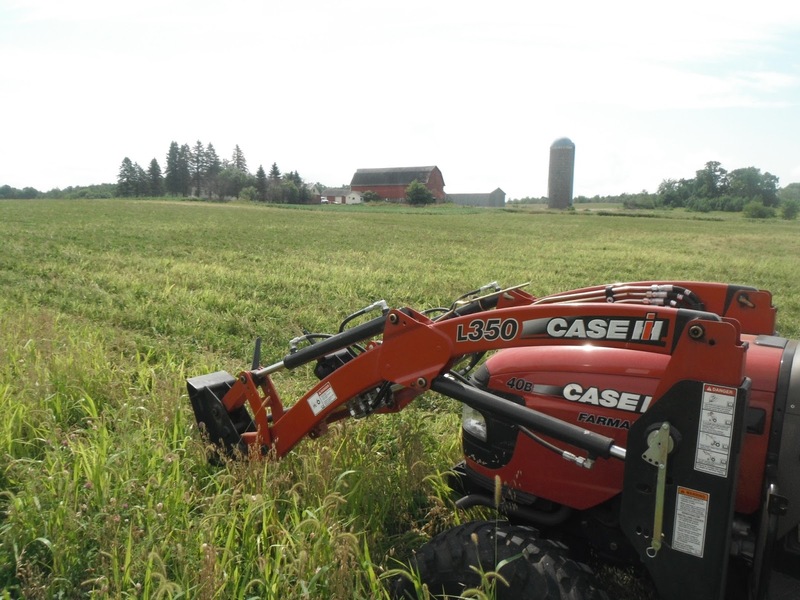 That should help build up soil organic matter which is said to reduce preexisting compaction. 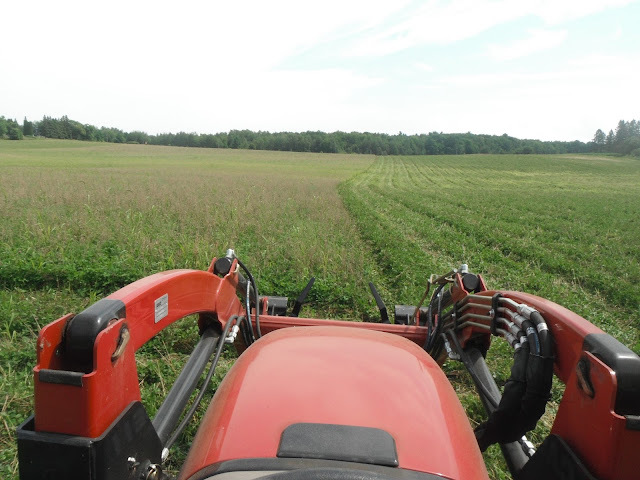 Spending so much time on the tractor going 2-3 mph gives you time to look at the weeds, among other things. I saw, in order of decreasing frequency - foxtail, ragweed, lambs quarter, giant foxtail, bull thistle, canadian thistle, giant ragweed, burdock. 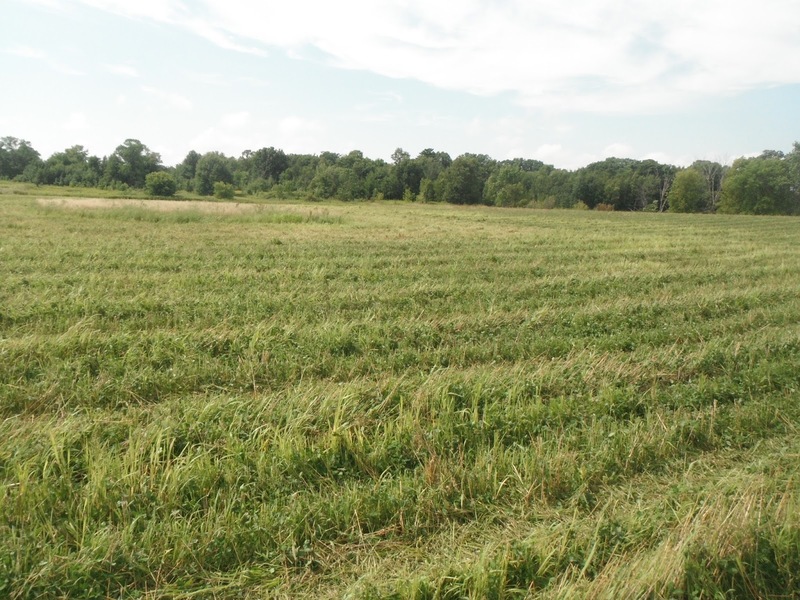 To give you some idea, by volume of plant matter over the 65 acres, I'd say there was roughly 50% clover, 25% oats, 20% foxtail, 4% ragweed, 1% of the remaining weeds. Bottom line - I'm happy with how things are shaping up. Tired but happy. 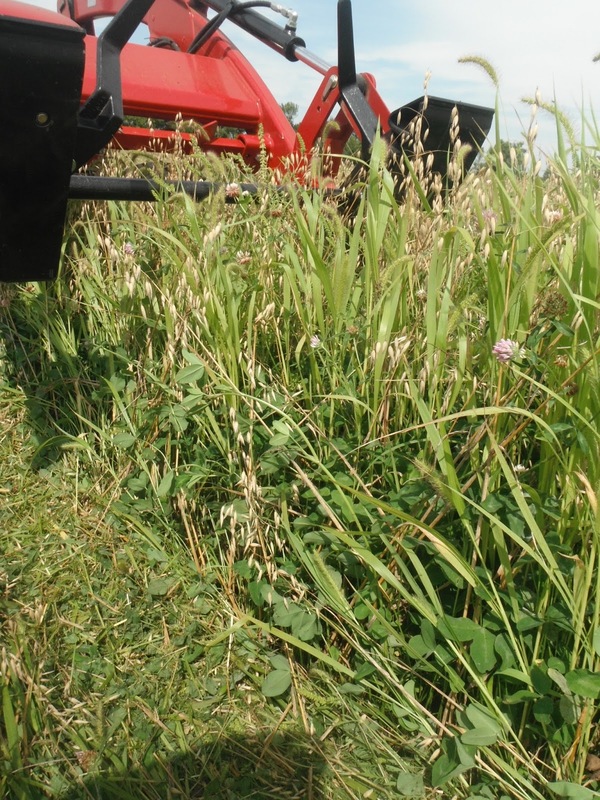 I have a solid stand of red clover, one that should stay viable for 2 years, with a lot of chopped up green and brown material to feed the bugs/microbes/worms. 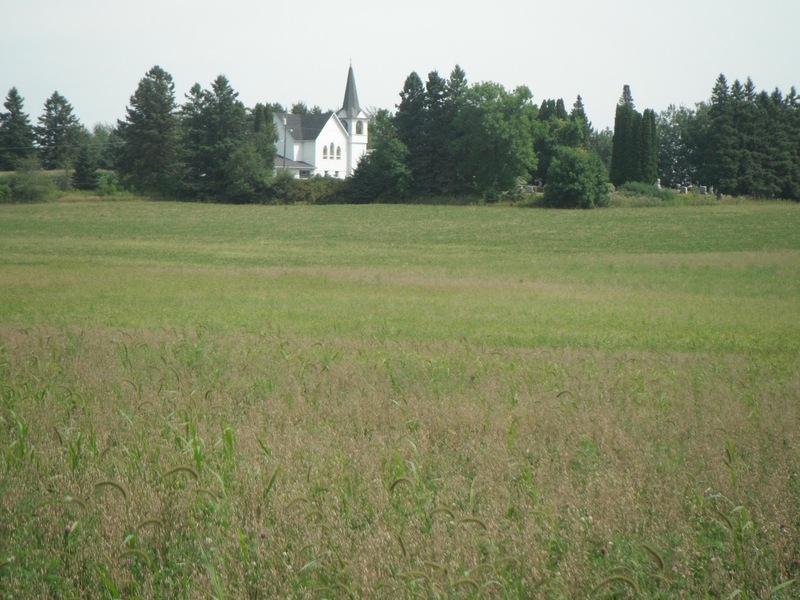 The possibility of a new stand of oats coming up this fall. The hope that I've put a big dent in my weed "seed bank", thus making my future a little brighter. You know, this could actually work!